With NASA's recent MESSENGER mission to Mercury, many new surface features have been discovered. These new features were discovered as a result of MESSENGER's imaging setup, which is far more advanced than any previous exploration vehicle, allowing for even more detailed views of Mercury's surface. With these newly discovered features, however, comes a need for new names. Typically, when naming features on planets, the International Astronomical Union (IAU) follows a theme or common idea to name similar features. 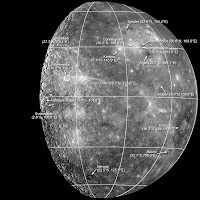 On Mercury, the IAU originally used "great works of archtitecture" to name ridges and valleys, such as Pantheon Fossae. The new naming scheme will be using names of deceased musicians, authors, and artists. The above picture shows the names and locations of some of the newly named features. Image courtesy of NASA/Johns Hopkins University Applied Physics Laboratory/Carnegie Institution of Washington.